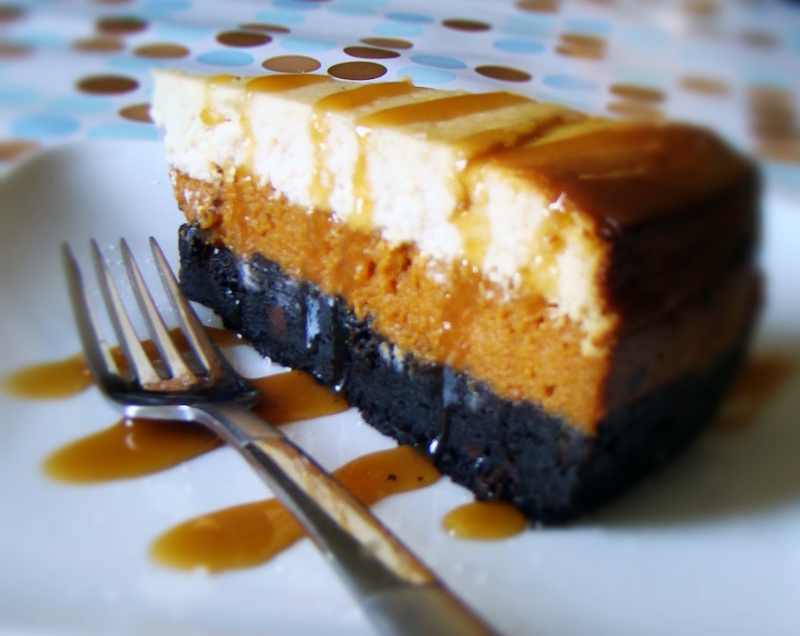 Well, we saved the best for last on pumpkin week with this delicious and VERY decadent pumpkin cheesecake. But, today, we went WAY beyond cheesecake by stacking layer upon layer of rich and flavorful goodness! The crust is made of Oreo Cookies and chocolate chips, the center a light and fluffy pumpkin pie filling, and the top, a creamy and sweet vanilla cheesecake. We topped it off with this season's hottest accompaniment, fresh, gooey caramel and a pinch of briny, natural sea salt. This dessert is totally over the top, it is beautiful, textured, colorful, and each bite explodes with all three of this recipe's different flavors. If you want to impress your guests after dinner during the holidays, this is your dessert. Fire up the treadmill ladies, this one's taking the cake! In a blender of food processor, crush the Oreos into a fine powder. Transfer to a large mixing bowl. Add Instant coffee and melted butter. Stir until combined and the mixture has a chunky, crust-like texture. Stir in the chocolate chips. Transfer the mixture to a spring-form cheesecake dish that has been sprayed with cooking spray. Press the cookie mixture to the bottom of the pan evenly with your fingers, creating the first layer, the crust. In a separate large mixing bowl, combine pumpkin pie mix, evaporated milk and 2 eggs. Mix well with electric mixer until mixture is smooth and creamy. Carefully pour the pumpkin pie mixture on top of the cookie crust. Spread evenly with a spatula. Tap the pan on the counter to even out the mixture and remove any bubbles. In a separate large mixing bowl combine cream cheese, sugar, 4 egg whites, vanilla and flour. Mix well with electric mixer until the mixture is smooth and creamy. Slowly stream the cheesecake mixture on top of the pumpkin pie mixture. 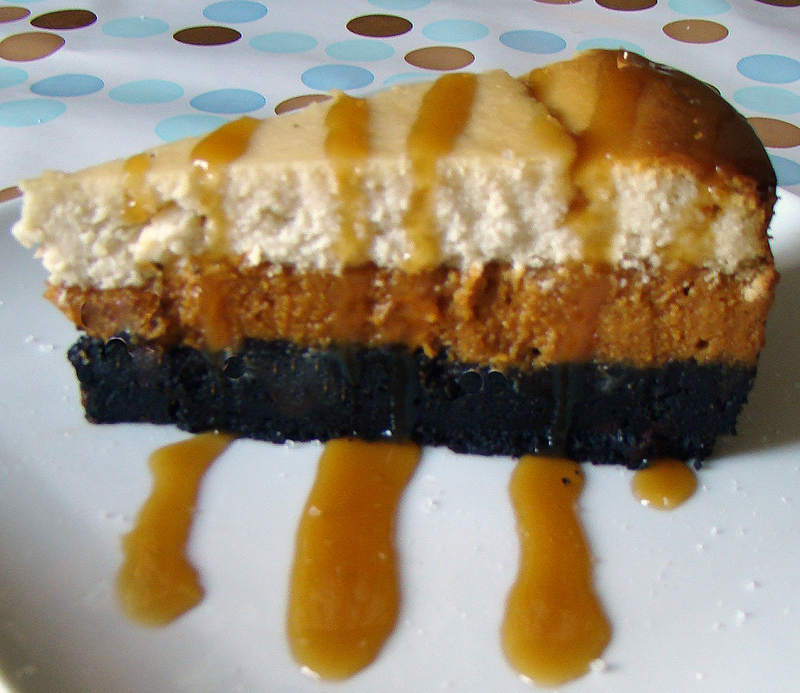 Pour lightly and slowly, so that the cheesecake sits on top of the pumpkin pie mixture and doesn't combine. Spread evenly with a spatula and tap the pan on the counter to remove any bubbles. Place the cheesecake in the oven at 350 degrees and allow it to cook for about 75-90 minutes, until the center is set. You may want to cover the edges to prevent them from browning too much. Remove the cheesecake from the oven and allow it to cool. Then place it in the refrigerator for at least 2 hours to allow the rest of the cheesecake to set. To Serve: Cut and plate the cheesecake. Pour melted caramel syrup on top and sprinkle with sea salt. Serve immediately.